If you’ve been following my blog for any length of time, you’ll know that I have a fanatic devotion to the Drabblecast, a podcast that produces a great speculative fiction story each week. I’ve been gradually working through all 300 episodes of the archives since I started listening a year ago, and as of last month, I’ve finally caught up. And what better way to celebrate such a thoroughly enjoyable year of listening than by making a “Best of” list? Therefore I present to you some of my favorite episodes picked from the first 300. I say “some” because my initial list had over 40 episodes on it, but I’ve forced myself to pick just 20 for this list. I’ve also left out of the rankings the Drabblecast B-Sides episodes (I may do a separate list for them) and episodes that featured classic speculative fiction stories (I’ve put a few favorites on their own list at the end). If you’ve not listened to the Drabblecast yet, any of these episodes would be a great place to start. If you do give them a listen, be sure to let me know what you thought. Drabblecast 211 – At the End of the Hall – Easily my #1 pick, both because it has one of the best readings I’ve ever heard on a podcast, and because it makes me cry like a baby every time I hear it. It’s incredibly life-affirming. Drabblecast 043 – Jelly Park – A very close second, this story best captures everything I’ve come to associate with the Drabblecast: how strange things sometimes feel like home. Are you the kind of person who mopes alone after a bad breakup, or are you a bus driver who hums to herself all day, because you have a secret? Drabblecast 129 – Annabelle’s Alphabet – A moving story married to flawless production. It’ll give you goosebumps. Also a great intro to Tim Pratt’s work. Drabblecast 083 – Floating Over Time – It’s a truth of the human condition that life is never long enough, whether you live two years or two million years, and that none of us get any assurances in the face of death. Drabblecast 039 – The Beekeepers – Parasitic wasps and alien invasions. This is top-notch horror, but I’d recommend that you have a strong stomach going in. Drabblecast 298 – Flying On My Hatred of My Neighbor’s Dog – It’s funny. It’s dangerously funny. The kind of funny that causes you to suppress laughter until it bursts out anyway, and all the strangers in the vicinity will decide that you’re unstable and dangerous. You’ve been warned. Drabblecast 246 – The Kidney – I’m a sucker for anthropomorphic bodily organs just going about their business. It’s surprisingly moving for such a ridiculous concept. Drabblecast 299 – The Revelation of Morgan Stern – Remarkable for being both a great post-apocalyptic horror story and a great love story. Drabblecast 025 – The Worm Within – I love this episode, but I should warn you it’s gross in a potty-humor sort of way. But since I write this Medical Microfiction blog, you won’t be surprised at my love of subjects like intestinal worms. Drabblecast 155 – The Second Conquest of Earth – This is the story I’ve always wished I could write about cold readers. Excellent all around. Drabblecast 198 – Love in the Pneumatic Tube Era – A shamelessly romantic sci-fi love story. There’s not an ounce of cynicism in this one, and that pleases me. Drabblecast 106 – Boiled Black Broth and Cornets – Frank Key is an odd, odd author. I might compare his style to Dr. Seuss in that they both enjoy word play, but it’s hard to describe unless you hear it. Listen to this one. You won’t regret it. Also, I think Norm deserves a standing ovation for the tongue-twister at the end. Drabblecast 192 – Rangifer Volans – More Tim Pratt, this time with a Christmas-themed story! Cryptozoologists go looking for flying reindeer. It’ll make you laugh, I promise. Drabblecast 058 – Eggs – Another “Medical Microfiction” pick, and also about parasitic worms, this time of the cat-exploding variety. It’s gross, it’s hilarious, and it’s deeply disturbing. Drabblecast 236 – When You Visit The Magoebaskloof Hotel – I picked this one because I enjoy well-considered sci-fi, especially when a story taps into true alien psychology. This story also read like a parable of sorts. I listened to it a couple of times before I felt like I understood it, and got something new out of it each time around. Drabblecast 292 – Hollow As The World – It’s about Minecraft, and a teen dealing with the unexpected death of his best friend. I loved it from start to finish. 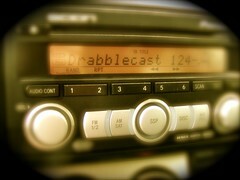 Drabblecast 150 – Morris and the Machine – Yet more Tim Pratt! A time travel story about a man who cheats on his wife… with his wife. It’s rife with some interesting moral conundrums that left me chewing over the story for days. Drabblecast 091 – Gifting Bliss – It’s a parody of Kurt Cobain and Nirvana, but I found this episode surprisingly moving. Norm created and performed a set of Nirvana song parodies that made this episode particularly outstanding. Drabblecast 274 – Amid The Words Of War – Another example of a well-considered alien species which feels extraordinarily inhuman. The story is written so well that you feel for the aliens anyway. Drabblecast 265 – Pop Quiz – First, the main episode is great, which is quite simple but has a great payoff. but this episode also features a Frank Key story about this Shatner-like captain on an epic voyage for nougat. And that is awesome. Drabblecast 281 – Doubleheader XII – More Frank Key! This episode is a particular favorite of mine because of the reading, and the way the two stories fit together. Drabblecast 017 – Morton – Sometimes the jerks in life have all the luck. Also, it’s worth noting how even the early episodes of this podcast are very high quality. Drabblecast 286 – Unique Chicken Goes in Reverse – If you’ve read Flannery O’Connor, you’ll really appreciate why this story is hilarious. If you haven’t, you should listen anyway and then go read Flannery. Drabblecast 191 – Primary Pollinator – A humorous sci-fi piece about the lengths you have to go through to maintain an alien ecosystem. Also makes me really glad that plants aren’t sentient. Drabblecast 135 – “Hello,” Said the Stick – This one’s hard to describe without spoilers, but it does, indeed, involve a talking stick. Drabblecast 115 – Clown Eggs – An episode that balances humor and horror in perfect measure. If you weren’t terrified of clowns, you will be. Drabblecast 113 – Charlie the Purple Giraffe Was Acting Strangely – I don’t always like meta-story humor, but this one worked well. Feel for the poor comic book characters who suddenly realize we’re watching them. Drabblecast 082 – An Overgrown Clump of Narcissists – A perfectly weird story with a nice twist at the end. Drabblecast 075 – Trifecta IV – The stories are good, but it’s the original song written by Norm Sherman to commemorate the first 75 Drabblecast episodes that makes this one outstanding. Drabblecast 052 – Sleep Age – A bit of magic realism cast in the form of a thought experiment: what if we could commodify and sell sleep? Drabblecast 142, 143 – The Golden Age of Fire Escapes – This two-part story has outstanding production in the style of an old-timey radio show. If that wasn’t enough, it also features the concluding segment of Connor Choadsworth: In Search of the Mongolian Deathworm! Drabblecast 257 – Judgement Passed – A team of scientists returns home to Earth to find that Jesus showed up and Judgement Day’ed everyone while they were gone. Now what? Drabblecast 109 – Babel Probe – Time travel, alien horrors, and the ancient Middle East. Nuff said. Drabblecast 234 – Jagannath – Another great story about symbiosis, where humans maintain an alien’s body from the inside. Drabblecast 217 – Followed – This episode is a parable for consumer culture, and the invisible consequences of having cheap things. It’s also one of the most clever zombie stories I’ve ever heard. Drabblecast 124 – Ghosts and Simulations – This one hit close to home. A story of terminal illness, what kind of immortality technology might offer us, and whether this is a good thing. Drabblecast 188 – The Store of the Worlds – If there are infinite dimensions, somewhere out there is one that fulfills your most desired dream. Reading this makes me want to go back and listen to them all again – My list is pretty similar to yours – http://cjsandspot.wordpress.com/2013/05/07/best-of-the-drabblecast/ – The one I recommend most to tempt new converts is the Last Question – I think a lot of sci fi fans already knew that story, but I didn’t, and it blew me away. Um, AWESOME list! It’s hard to just pick a few, eh? I think it would’v been easier to make a list of my 10 least favorite episodes – except I can only think of like 2 that I didn’t care for. I am still SO SAD that the Gifting Bliss CD doesn’t exist. Shouldn’t that be Norm’s third CD? Can we start a movement demanding this? A kickstarter? SOMETHING? Ok Rachael support me on this – I know you want to!